Ah, when your baby sleeping gives you time to get things done it is wonderful! I thoroughly enjoy when my kids are sleeping, which is why I enjoy when they take long naps. However, sometimes babies love to wake up after just a short time of sleeping. If you want your baby to take longer naps, check out these tips. Make Sure Your Baby is Full- I don’t know if you’re nursing our not, but it’s always hard to unlatch my baby and lay her down. As soon as I unlatch her, she cries and wants to latch again. I try and give it a good half hour to make sure she has gotten plenty of food in her tummy. If your baby isn’t full, they are surely going to wake up from their nap a lot sooner than you want them too. This is a great way to start getting your baby to sleep longer. Your Baby May Be Cold- Another thing that could prevent your baby from sleeping longer at nap time is that they’re cold. You never want to dress your baby too warm for bed, but you also want to make sure they’re not cold. I can imagine adults don’t sleep well when they are either too hot or too cold, so always pay attention to how you’re dressing your baby. Make sure you can encourage your baby sleeping longer by checking their overall temperature. Not just for fever, but for comfort. Your Baby May Need More Than One Nap- One thing I noticed with my kids is that the more they slept, then the better they slept. If they took an awesome nap that day, then they also slept better at night. I really work hard at trying to make sure my kids get good rest. I wish I could go back to the days of sleeping like a baby, don’t you? Allow Baby to Sleep with Something of Yours- Whenever I leave our daughter home with my husband, she loves to hold onto my scarf. It smells like me and it makes her feel as though she’s close to me. I firmly believe that babies just want to be with their mommies whenever they are frequently waking up. You can either sleep with a baby blanket and then give it to your baby to sleep with, or you can allow them to sleep with a small garment of yours. I don’t recommend doing this when your baby is really little because you aren’t supposed to leave anything in the crib with them. However, as they get to being 2+ they can have things in their crib. Here is an excellent guideline on when and what is safe to put into a crib with your baby. Allow Them to Sleep on Their Own- I don’t feel as though you have to let your baby cry it out to teach them how to sleep on their own. A few of my kids actually slept better and longer by dozing off on their own. I would try allowing your baby to learn to sleep on their own because they may just take a longer nap that way. This works because if they do wake up during nap time, they can put themselves back to sleep, instead of relying on you to put them back to sleep. Make sense? 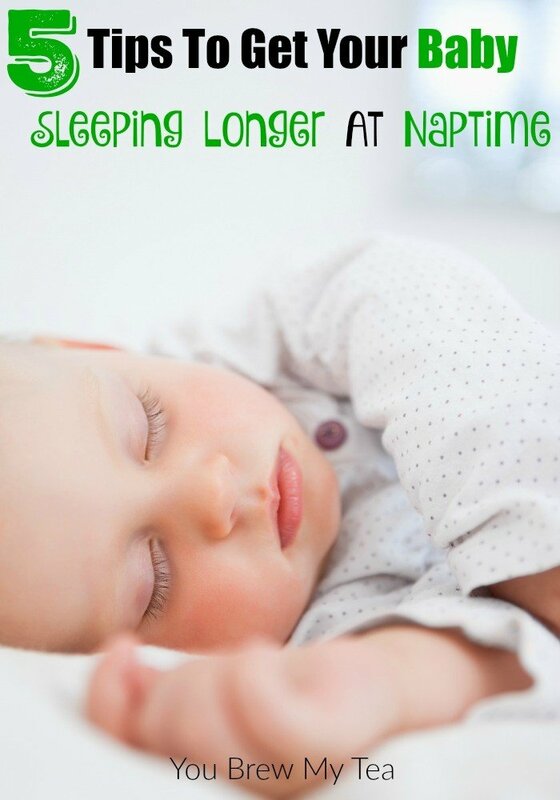 What tips do you have for getting your baby to take a longer nap? If your goal is to have your baby sleeping longer during their naps, these tips are a great place to begin. It’s easy to work these into your routine, and allow your baby to adjust and rest better. Check out some of our other tips for new parents and babies!